Today's latest "zoodle" recipe: A Greek salad gone spiral, a big jumble of zucchini noodles, tomatoes and olives tossed in an oil-free Creamy Feta Vinaigrette. It's the salad of the summer, people! And you won't believe that those noodles aren't pasta! Weight Watchers Friendly, WW 2 PointsPlus. Low Cal. Low Carb. Gluten Free. Vegetarian. So here's a salad – if our tastes are similar, and they are, right? that's why you're reading? – that you'll make all summer long and might even dream about in-between times. The first time I made the salad, we were rushing out the door, pleased to spend a lazy Saturday with friends basking in late-summer sunshine in the silence of the Missouri countryside. Honestly? I just winged it that day, hapdash-style throwing a few "Greek style" vegetables into a bowl. For the dressing, I went for a tried 'n' true recipe, the Creamy Feta Vinaigrette works so well in a real Greek pasta salad, made with actual pasta, Greek Pasta Salad – except, me being me, always experimenting, always learning, I substituted buttermilk for the usual olive oil, creating an extra-creamy and no-added oil g-o-r-g-e-o-u-s dressing for the vegetables. That sweet-September day, our friends laid out a lovely spread but oh! the Zucchini Noodle Greek Salad! Lucky, lucky, I'd nailed it the first time, for sure. And our hosts? They couldn't believe that the "noodles" weren't pasta but zucchini! That made for a really full-tasting extra-healthy salad. If that's your taste, well, here's your salad for the summer. I've got a feeling it's mine, too. 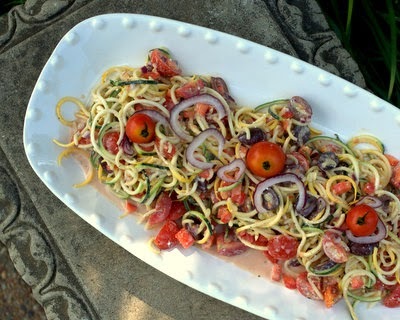 GREEK-SALAD VEGETABLES Use a "spiralizer" to cut the summer squash into short noodles. Combine in a large bowl with remaining vegetables. The vegetables may be cut and collected up to a few hours ahead of time (in the morning, say, for an evening meal). CREAMY FETA VINAIGRETTE Combine all ingredients in a small food processor until smooth. The dressing may be made ahead of time and will keep for a day or two. TO COMBINE An hour or so before serving, toss vegetables with vinaigrette. Refrigerate until ready to serve. TO SERVE Transfer to a serving bowl or platter, top with feta crumbles and onion rings. No spiralizer yet? I'm happy to have this one but there are other brands and styles. I used one green zucchini and a yellow squash. I think it might be prettier with more green? The yellow color really doesn't reveal itself. A little onion goes a long way! Two ways to help this, one is to cut the onion really small so that there are many little bits to distribute throughout the salad. The second is to dice the onions and then soak in cold water for about 15 minutes, then drain and dry; this removes the harsh bite of onion that some people find objectionable. NUTRITION INFORMATION Per Serving, assumes 6: 91 Calories; 6g Tot Fat; 2g Sat Fat; 11mg Cholesterol; 437mg Sodium; 6g Carb; 1g Fiber; NetCarb5; 3g Sugar; 4g Protein. WEIGHT WATCHERS POINTS: WW Old Points 2 & WW PointsPlus 2 CALORIE COUNTERS 100-calorie serving = slightly generous serving. So do you have a camera in my refrigerator or something? Every recipe almost, I’ve already got all the ingredients right here. This salad is calling to me -- the only question is, lunch or dinner? Ali ~ Ha ha, I love it when that happens! Usually it’s brownies though -- and I must use exert great fortitude to resist! Let me know how the salad goes over! I made this tonight, I subbed sour cream for the buttermilk cause that's what I had. I wasn't sure what "table salad" was really supposed to be, so I put in a little olive oil. We all loved it, next time, more squash, it's the best part!